June 2016 marks 53 years since my family's arrival in Alaska from Lake Zurich, Illinois, a Chicago suburb. I was four at the time when we drove the Alaska-Canada Highway or "ALCAN," pulling a homemade trailer containing our entire life possessions. We crossed the border into Alaska on June 30, 1963. After spending the summer camping in a six-man tent on the beach near Ninilchik and elsewhere, our family settled in Chugiak on Birchwood Loop Road. We survived the March 1964, 9.2 Great Alaska Earthquake - the second largest in recorded history - nine months after our arrival and about a hundred miles from the quake's epicenter. Our family lived in a small house built in the 1950's from surplus lumber from nearby Fort Richardson. Our 400 square foot home (essentially a large cabin built on creosote posts) was heated with a fireplace by wood harvested from local trees and coal from Buffalo Mine outside Palmer. We had no running water after the earthquake collapsed our hand dug well, so water was drawn from a creek from the nearby Chugach Mountains at Moose Horn. We initially had no telephone service except for a military hand crank phone connected with a few neighbors from wires strung through the woods. My siblings and I were raised on salmon, moose and caribou and vegetables from our large garden and gleemed from farm fields in Palmer. 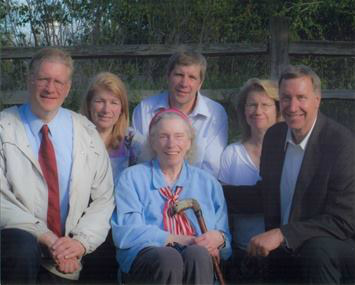 We lived a frugal, simple lifestyle, but our close-knit family of seven was happy and comfortable thanks to loving, hardworking, Christian parents determined to make a better life for us. We attended Church in the Wildwood in Eagler River, which was originally housed in a quonset. In 1969, we moved to Anchorage and renovated a 1920's-era house that was relocated from downtown to the south part of town close to where the Dimond Center Mall, the state's largest, exists today. I worked with my father in construction contracting following my graduation from Dimond High School in 1976. Our family moved to Wasilla that summer on a large tract of land my father and I developed into Kohring Subdivision. Flag (as in U.S. flag) Circle, our street, was originally cleared by me as a 17-year old, using a 1940's Caterpillar D7 cable dozer. I remain living in the subdivision to this day. "Family is where life begins and where love never ends."